According to latest survey released by New York based financial newswire service, Bloomberg, Africa’s largest economy Nigeria has been ranked among 20 fastest growing economies in the World. Leading online shopping community Kaymu has attributed Nigeria’s listing to the upshot of e-commerce in the country. 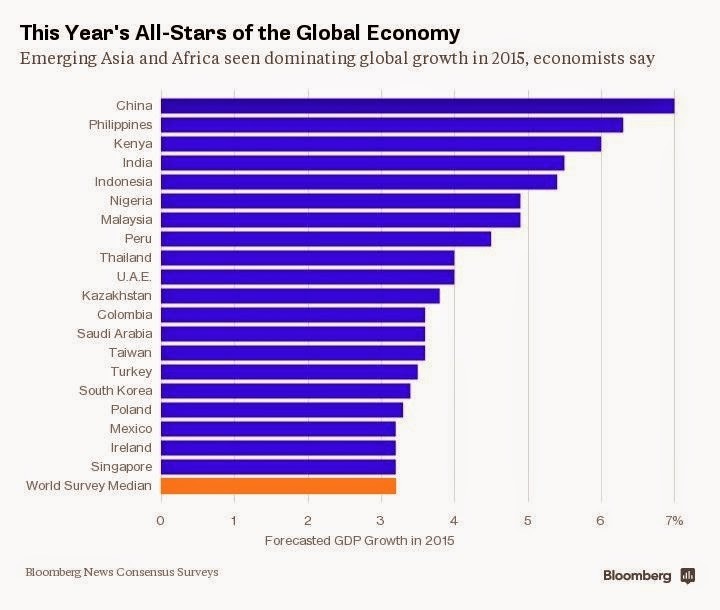 In an accompanying chart by Bloomberg, Nigeria with an expected growth rate of 4.9% was ranked sixth behind China (7%), the Philippines (6.3%), Kenya (6%), India (5.5%) and Indonesia (5.4%). Managing Director of Kaymu, Evangeline Wiles, in a statement released by the company, said, “Nigeria’s e-commerce space is the fastest growing in Africa contributing a monthly spend of 1.3bn to the Nigerian retail sector. The role the retail sector plays in driving Nigeria’s economy cannot be overemphasized as a country’s purchasing power is a major driver of the economy”. The explosion of the E-commerce space in the last two years has fuelled a massive consumer behavioral change. E-commerce in Nigeria records over $2m worth of transactions per week and close to 1.3bn per month from the 38% of Nigerians who prefer to buy products through the internet, according to a survey conducted by the business management and consulting firm Philip Consulting. Nigerians have a vast spending culture both locally and internationally. Recent statistics from Heathrow Airport show that Nigerian travellers – who patronize the service – spend an average of £1,059 per visit on luxury retail. The Minister of Communication Technology, Omobola Johnson has said that E-commerce has attracted over $200 million foreign investment till date thereby expanding infrastructure, warehousing, advertising and logistics services industry. Explaining how e-commerce application has impacted the nation’s economy which is projected to have a market potential of over $10 billion, the Minister added that in the last two years (2012), it was worth $35 million, and now (2014) it is valued at about $550 million and has moved from 1000 daily orders to about 15, 000, adding that the sector has in the last two years created 15, 000 jobs. If there is anything to look forward to in Nigeria this year, it is the rapid growth of the economy. CNN Money in 2014 stated that Nigeria’s economy grew by 7.1% and is expected to grow by another 7% in 2015.